The Fatima Apparitions, Mass UFO Sighting? Gustavo: After reading Graham Hancock's book 'Fingerprints of the Gods', I finally understood what the Sphinx (Giza) really was. G.H. reaches the conclusion that the Sphinx is indeed the body of a lion. Now, many of you might say: "I already knew that!". You're right, but what I'm trying to say here is that the Sphinx had also the head of a lion. Khufu, the Egyptian King, later ordered his men to carve his face on the Sphinx. The original Sphinx was indeed a full bodied lion...see what I mean? If the Sphinx was indeed carved on that single rock, 12 thousand years ago, then it must be one of the oldest symbols of Isis, Our Lady, on this planet. To be more precise, the lion is one of the symbols of the DOMA, and the Giza structures are definitely related to the DOMA. Fatima's 'third secret' holds no apocalyptic message. FATIMA, Portugal (CNS) - the much discussed "third secret of Fatima" is not sensational or apocalyptic, said Cardinal Joseph Ratzinger, one of the few people in the world who has actually read it. Cardinal Ratzinger, prefect of the Congregation for the Doctrine of the Faith, was at the Shrine of Our Lady of Fatima for the 79th anniversary of the final Marian apparition to three Portuguese children, Oct. 13, 1917. He was asked about the so-called third secret Oct. 12 by Radio Renascenca, Portugal's Catholic radio station. "To all the curious I would say I am certain that the Virgin does not engage in sensationalism; she does not create fear. She does not present apocalyptic visions, but guides people to her Son. And this is what is essential." said the cardinal, who was shown the third secret by Pope John Paul II. After a lengthy investigation of the alleged apparitions, the Catholic church in 1930 said the visions were worthy of belief and authorised devotion to Mary under the title of Our Lady of Fatima. 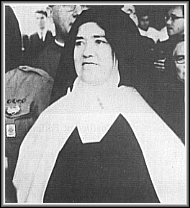 Lucia 50 years after the Fatima apparitions. In the late 1930s and early 1940s, Lucia dos Santos, the last surviving visionary, was asked by her bishop to write down her recollections of the apparitions and the messages. The first two segments of her writings have been published. Gustavo: Until here, everything is correct . "The published segments urge prayer, repentance, recitation of the rosary and reception of the sacraments. They contain specific references to war and to the conversion of Russia, and are popularly referred to as the first two secrets." Gustavo: There is no way to find if what Lucia says is true.One important fact to consider is that the children at that time didn't have the same knowledge we have today. Cova da Iria (the place at Fatima where everything happened), and the surrounding region where at that time one of the regions in Portugal where there was almost no educational system. The School and the Church were intimately related and therefore the main education these children had was a religious one, namely Catholic. I'm not saying that the children invented all that stuff - what I'm saying is that their worldview was somehow limited. This certainly led them to interpret in the wrong way, some of the messages sent by Our Lady. After reading Lucia's writings, one can totally accept them in a religious way of seeing this world. I think that Our Lady's messages were not meant to be interpreted the way the children did, or where led to say. If they were 'channeled' through a knowledgeable person, the message would be far more wider - definitely to broaden our spirit and our way of seeing things - not through religious words that only helped this male religion to become more stronger and the people to stay in ignorance. Praying is right, but we must know how to pray - we must pray to ourselves and find The One that is inside of us. Our thoughts are very important, and that is why Our Lady mentioned praying - We must think good to do good. Basically this is what the Apparitions are all about, and as you can see, the Catholic Church has been always there to tell things their way. They have been leading people to say things their way, in order to keep them, once more, in control. Vatican officials throughout the past 50 years have said the third part of the recollection written by Lucia, now a Carmelite nun, contains nothing that is not already part of the revealed truth, so it is unnecessary to publish it. In the interview Ratzinger said preoccupation with the message and its presumed predictions of catastrophe are not part of a healthy Marion devotion. "Instead, the intention and the centrality of the mission of the church is to guide people toward those things that are truly important," he said. "Only in that way are we truly obedient to Mary." Mary's purpose "is, through (the children of Fatima), to call the world back to simplicity, that is to the essentials: conversion, prayer and the sacraments," he said. Gustavo: Conversion, not in the way they tell us. Conversion, for them, is to become of one religion, one out of many, the Catholic Religion. This is not conversion. Conversion, is, like Ratzinger almost said, only "to call the world back to simplicity." Back to the One. And this can only be done through meditation (prayer), so that we can distinguish right from wrong and do only good in life. Understand here, that to pray correctly is not to repeat all those memorised words - it is to thing only good. The problem here, is that We mustn't stick to a religion. The only true 'religion' here is the one that gives us knowledge about the Universe, and this is done trough Love, and using the Self to know the Self. Like I told you last week, I was going to write down the most important facts of the apparitions at Fatima. This data was collected from many sources, all of them highly reliable. I would also like to mention that if I wanted to write down all of the available data here in Portugal, I would certainly be writing it down for the next couple of years. Due to the fact that this research was meant to be related to the DOMA intervention, what I did was to search only for the most important clues for this topic. "Mother! I saw Our Lady at Cova da Iria! - said Jacinta at home, on the 13th of May, 1917. ", Joao de Marchi, 1966. After many years of research, it was concluded that the lady the children and many other people saw that year, was a lot different from the one that the Catholic Church today displays at the ceremonies. During that time, and especially at Fatima, about 75% of the population couldn't even read a single word. It is now a proven fact that the children (in this case, Lucia) later described the lady with some modifications, in order to be more compatible with other apparations. The 'original' lady that appeared at Fatima wore simple clothes. - A very beautiful woman. - There was a surrounding light. A very bright light. Before I continue, I'd like to say that everything seems to point out to the fact that the lady wasn't real. It was some kind of hologram. If you do your own research you'll find that too. I'd also like to refer that in the 13th of October 1917, the people which stood not in front of the image, but lateraly, were able to see a beam of light coming down from the 'second Sun' of the sky - that 'silver Sun' which originated the so called 'Miracle of the Sun'. It's was obviously a craft. - She wore a long white robe, which covered her hair and ears. - She had black eyes. - She wore something similar to ear rings on her neck. Just like the representation of Ishtar (see her statue or the drawing in the book Highway to Heaven from Zecharia Sitchin). - She always came from heaven (or the image). Her image travelled from the disk to the top of the tree, where it stood and spoke telepaticaly with the children, until travelling all the way back to the same object in the sky. - She NEVER moved her lips or any other muscle of her face. She only moved her hands, once in a while. - Everytime she went back to 'heaven', she would turn her back to the people, but never moved her legs. She would go in a perfect straight line, into the clouds (or into the 'second Sun' just like what happened in October). Lucia mentioned that Our Lady told her something about a 'capela' or in English, a chapel. And she also told her about the 'terco' (it is read 'tersso' in portuguese), which is no more than the set of counts (that's how we call it!) (the rosary) used in while praying. - the planet Venus; - Stella Matutina (Venus or Virgin Mary); It also looks like an ankh, which is also depicted in the hand of Isis (Virgin Mary) on an ancient amulet as she holds her child in her arms. NOTE: This reminds me of something: Queztalcoatl (the great civilizer of Central America) was contemporaneous with Buddha (correct me if I'm wrong), and he is also called Stella Matutina according with the ancient Mayan codices. This requires some investigation. If this is correct, Quetzalcoatl and perhaps Viracocha (Inca) were sent by the DOMA. And more: Orejona, the divine Lady which appeared at Lake Titicaca in the beginning of time, has something to do with ISIS! I have a description of her and will tell you more about it (later...). This clearly depicts Her intention to identificate. The day of the month (13th, from May to October) also tells us who this lady was. As we know it, 13 is her sacred number and the name Fatima was the legendary name for Buddha's mother. But what bothers me most, is the fact that more than 80% of what the Catholic Church has been telling us through Cardinals and through Lucia, is a lie!!! The original message of the beautiful being that appeared at Fatima is lost. Her intention was to get to the Church leaders, through simple children, and through a great demonstration of technology to validate Her Reality! She managed to acomplish this, because I believe they knew what was meant to be known. But once again, they didn't change themselves nor their economicaly and politicaly-based pseudo-religion! NOTE: The symbol above looks very much like the Rosary which is composed of 5 decades (each decade containing 10 prayer beads) and hanging on the end of the circle of the Rosary is the Crucifix. The larger (or complete) Rosary is composed of 15 decades. The 15 decades coincide with the 15 Mysteries of the Holy Rosary which are important events in the lives of Jesus and Mary. "When the children started running to the tree we did that too... then we started to hear something. It sounded like a 'high frequency voice' (it's the only way I can translate this), but no one could understand a single word (if there was any). It was like the sound of bees." Maria Carreira, witness. Strange phenomena's occurred at Fatima during that time period (from 13th of May to 13th of October). On every 13th of the month, the Lady appeared in front of the children, which in turn had been instructed to go to that same tree and wait for Our Lady to appear on those specific dates - she obviously told them this on the 13th of May. Of course, many people knew what was going on, including their parents and many locals. 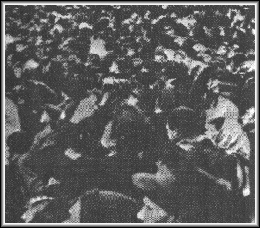 These people, along with 50 to 70 thousand more which came to see this female being, were the witnesses of the apparitions at Fatima. a- Flashes of light in the sky. These even occurred during daylight, which made people think it was definitely a miracle. They were always seen right before she appeared over the tree. The Lady made her appearances around 12pm. There were lightning's in the sky and immediately after that, her image would appear over the tree, from bottom to top (like a curtain being pulled up). Jacinta and Francisco (the other two children) described the lightning's as "projections of a light... A light that was coming closer to us." "Mixcouatl, the thundering serpent of the clouds." Aztec legend. "Thunderbirds which flew in the skies." North American Indians. "Tane, the god of Thunder." New Zealand. "Zeus, the owner of Thunder." "Rama and Bhima climb the skies in a mixture of fire and Thunders." Hindu legends. c- The sound of "many bees". This sound was always heard during the apparition. Needless to say that this is a typical UFO related sound. d.1- The "Smoking Cloud". This 'cloud' which obviously isn't a cloud, was a very little one (perhaps the normal size of a UFO! ), and 'travelled the sky'. It was grey and always stood over the tree. It was a "...walking cloud" !!! d.2- "Coloured clouds". These clouds "crossed the skies" on the other days of the months. They were seen very high in the sky, usually appeared white, and then changing colour to red, purple and yellow. Often travelled against the wind. These 'clouds' were described as "beautiful". Isn't a UFO a beautiful cloud?! e- Temperature variations. When Our Lady was there, the temperature decreased to a "nice and gentle breeze of fresh air". f- Normal daylight decreased intensity. This is how people described. The strongest light in the sky was the light around the image. g- The smell. Many people, including the three children reported that there was always an unusual smell in the air. They said that this smell had no comparison and that it was totally unknown to the people. Although, it was a pleasant smell. You just need to read some UFO sighting reports to find out that different smells, or in this case pleasant smells, are common. "it was some kind bright globe, spinning in the clouds." Manuel Marto, The Official Reports, 1923. "The clouds were big and colourful. And there was something inside them that shone very much, just like silver. "Maria Carreira, Stella magazine (p21), May 1943. "At one o'clock, when the cloud faded, we all became amazed to see this beautiful silver globe, doing this little twist, and then zigzagging through the clouds. This happened for three times with 3 to 4 minutes of interval." Correio da Beira, 10th of November, 1917. "It was 1pm and the sun was descending on the sky" Joaquim Xavier Tuna, Arquivos Formigao, 13th of November, 1917. "When we were begging for the Queen of Heavens to appear, we saw this white oval shaped object in the sky. It was a bright white and this oval object had its largest and flat surface under it. It crossed the sky in a perfect straight line." (this is what we would call a flying saucer) Joel de Deus Magno, Jornal "A Guarda", Arquivos Formigao, 13 of September, 1919. Long before 1947 (when sceptics say that Urology was 'invented') people around the world, were already making typical UFO descriptions. People also told that there was a "road of light", between the heavens and the Lady. When Our Lady went back to heaven, this "road of light" would also fade, from bottom to top. i- Wind Changes. Unusual variations on the wind when the "silver cloud" stood over the tree. j- 'Angel Hair' falling from the sky. In Portuguese we call it "fibra alvina". This is very usual in UFO sightings. White pieces like hair fall from the sky when a UFO passes by. This happened a lot during this century, and once again, at Fatima, 1917. People called it the white flowers of the Lady. "She is giving us flowers!". But what happens is that 'Angel Hair' is very, very thin and it breaks easily. So when people were trying to grab the 'flowers' that were falling from the sky, these sets of entwined white flocks, would break in their hands, just like they were disappearing. What the locals concluded was that the flowers vanished when someone tried to grab them. This substance looks just like cotton. The results were: -Sodium, Carbon, Hydrogen, Oxygen, Calcium, Magnesium, Boor(?) and Cilium. Its decomposition temperature is 280 degrees Celsius. They burn easily in a strong flame, they are attracted from electrostatic charges, they stick firmly to wood. It was also found tritium (radioactive hydrogen isotope) in this substance in 1977 according to Prof. Allen Hynek. k- Animal behaviour. The three children were with some sheep's at the time Our Lady first appeared and in other few occasions. While she was speaking "inside their head" and the sound of bees being heard, these animals just stooped eating. It's as if they were being controlled. TYPE June July Aug. Sept. Oct.
As you can see, many of these phenomenon's didn't occur on every month. Also, in the text above this table, I mentioned that some of these phenomena's occurred every time the Lady appeared. In some cases this table contradicts what I said. This is due to the fact that witnesses and newspapers of that time reported that - and this is what I wrote above the table. Although, in this table, are only represented those witnessed facts which I consider high reliably, or in other words, that in fact occurred at that time. I'd like to thank Joaquim Fernandes and Fina d'Armada, the author of the book "The Apparitions at Fatima and the UFO Phenomenon", for their outstanding research in this subject. Many of the information in this post was taken from this book. On Fatima, Part 1 (my first post), I told you that in this one I was going to talk about that particular day when almost 70 thousand people witnessed what was called 'The Solar Miracle', 13th of October. As you can see I changed my mind and decided to first talk about the previous months. I just hope that they made you think about the Reality of these phenomenon's, specifically the fact that we're being assisted by the DOMA. The events of 13th of October are the extreme demonstration of technological power of the DOMA. Good Wishes to all of you. Gustavo. Gustavo: Some of you asked me if Lucia was still alive. The answer is yes, but the other 2 children are already dead. (They died within 2 years after the apparitions as stated by the "Lady" in one of her visits.) It's has been very dificult to speak directly with Lucia, and mailing her isn't worth at all. You simply don't get an answer. Although she talked with a lot of people during the last years and much information came out. October 13th was the date the Knights Templar were arrested. (tongue in cheek here) I wonder if that was the origination of the superstition about Friday the 13th? Or could that truly have stemmed from something the DOMA foretold would happen on that day sometime in the future? "Modern" calendars begin the week with Sunday....I have found this to be so contrary to biblical teachings...."On the 7th day, He rested." Seems to me that the LAST day of the week would be Sunday.....ergo, actually a Saturday! (count this out on your fingers now and you will follow my next thought here) If you take a certain length of time to create something (7 biblical days), you can easily figure that to undo things in the exact same pattern, it would take the same amount of time. Lets, for simplicity sake, say you work six days, rest the seventh, then begin undoing what you did.....taking six days to undo things before your second rest. When you finish on the second sixth day, it would be 13 days! So, lets start our counting of days with the FIRST day of the week....Sunday....when we are ready to rest a second time, it will be Friday, the 13th day! Hmm.... Now, if I were completed with a task, before I began again I might be inclined to celebrate for a short time. "Fireworks" anyone??? ala the Night of Lights???? December would be the perfect month for this, because it is the 13th moon cycle of the year! Food for thought, huh? My calendar just got a bright red circle over the ink to sky watch that night! The following links are to sites with further information.